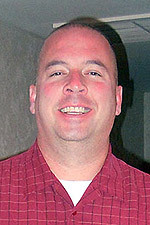 REDDING, Calif. - Twenty years ago, Jason Beeman had five classes left to graduate from Sacramento State University. Then the opportunity of a lifetime crossed his path – the chance to play pro baseball in Canada. “It was always my dream,” the 40-year-old Red Bluff resident said. He dropped out of college and moved north. Two years later his baseball career ended, and instead of returning to college, he started working. Sixteen months ago he returned to college, enrolling in Simpson University’s ASPIRE degree-completion program. On April 28, he was one of more than 250 graduates (including 76 ASPIRE students) honored during Simpson’s spring commencement. When Jason started with the ASPIRE program, he was working for the Red Bluff Police Department and knew he wanted to make a career change. He got a sales job with Lithia Toyota. He chose to major in Business Management. ASPIRE also offers bachelor’s degrees in Psychology, Liberal Studies, and Organizational Leadership. Jason knew it would be a challenge to jump back into studies. ASPIRE classes meet one night a week, or on weekends, for 16 months. His wife and teenage daughter and stepdaughter were supportive as he tried to balance work and homework. “It was helpful for (the girls) to see me practice what I preach about the importance of a college education,” he said. Jason graduated with honors, qualifying him for membership in Alpha Sigma Lambda, a national honor society for continuing education students.